August was another sparkling month on the English Riviera with lots going on and lots of lovely families taking THHN holidays. Read on for more about what went on as well as an announcement about a very exciting event that we have planned for next year – it’s going to be HUGE. There was a fun new event as part of Paignton Regatta this year, called Beat the Tide. An intrepid THHN team entered the competition and did us proud. The whistle blew and teams stretched along Paignton Beach started building the sturdiest, highest sandcastle that they could. The next whistle blew and the whole team jumped on top and waited for the tide to do its worst. Last team standing before the tide washed away all their work were the winners. Our fantastic gang built a sandcastle to be proud of and clung on for 3rd place, winning £20 for THHN funds and doing some wonderful PR on the day, so a big thank you to all the team for their sterling efforts! We know, the sun is shining and Christmas seems a long way away. Well, it is and we don’t want to get all wintry on you but we have planned our Christmas Party and we wanted you to be the first to know. So, here’s the low-down. Date: Saturday 13 December Venue: Palace Hotel What’s on offer: Welcome drink, four course Christmas meal, disco until 1am Price: £29.50 per person How do you book? E-mail thhnchristmasparty@hotmail.com or phone Emily on 01803 316126. Tickets are selling fast and we only have a limited number, so please reserve your tickets ASAP! We would love to see you there! Behind the scenes for some time now we’ve been working on what will be our biggest ever event and we are extremely excited about it. 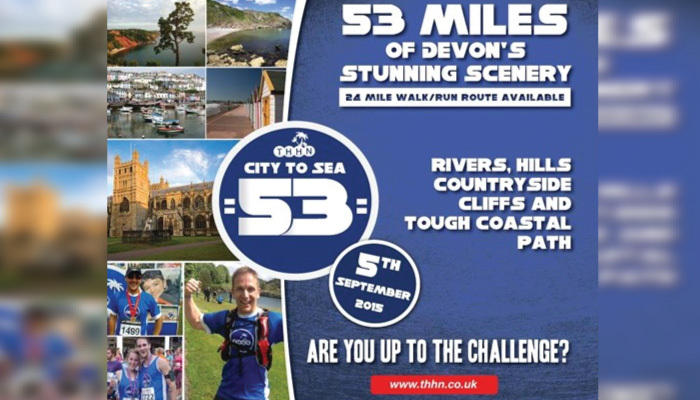 It will combine a tough ultra marathon with a huge celebration on Babbacombe Downs next September. We’ve put a team together to create a fantastic event which will be a “must-do” on the calender of all ultra marathon runners as well as a fantastic party on Babbacombe Downs which we hope will be an absolute treat that everyone will want to come and enjoy with us. We’ll bring you more information as we go along but, for now, get the date in your diary – Saturday 5 September 2015. You will NOT want to miss this. All our lovely volunteers who ran our fundraising stand at the Babbacombe Ukulele Festival this month down on Oddicombe Beach. Thanks to Babbacombe Cliff Railway too for inviting us along. We raised £153.20 – great stuff. Hyundai Torbay who donated a fantastic £600. St Marychurch Sainsbury’s who have made us their chosen charity for a year. The organisers of the wonderful Wigfest, as well as everyone who went along. What a great weekend with £2006.32 being raised for us. The lovely ladies chorus “Yours in Harmony” who have been out singing to raise money for us once again raising £256.71. Torbay Family Butchers Ltd, Claire’s Cakes, Westcountry Fruit Sales, Hallets the Bakers, Riverford Torbay and South Hams Delivery, Teddy’s Cakes and Save on Meats, Torquay. The Marine Hotel in Paignton who welcomed families referred by Rainbows Hospice, North Devon Lifetime Service, the Rainbow Trust Children’s Charity and the Joss Parkes Searchlight Charity. Thank you so much for all your support. Always happy to help they’ve been particularly fantastic this month. The Hotel De La Mer who gave holidays to families referred by the Society of Parents of Children with Cancer and the Bristol CLIC Sargent team. As usual, huge thanks to everyone who helps with our Memory Maker Caravan. This month it has been holiday home to families referred by Alstrom Syndrome UK, the North Devon Lifetime Service and Birmingham St Mary’s Hospice. Everyone who took part in the Kings Norton Tiny Tots sponsored toddle who raised an amazing £575 for us. Toddle-tastic! Brunel Manor who welcomed a family referred by the Leicester CLIC Sargent Team. All the runners who took part in the Torbay 10K, including our very own Brilliant Brian. Our great friends at the Torbay Half Marathon who donated £500 as a thank you for our help marshalling the event so thank you from us to all our volunteers who played such a huge part in helping that day. Simon Wills at Babbacombe Model Village who took part in the Ice Bucket Challenge raising funds for us. There’s even a model of him doing so! The lovely Vicky, who owns Fancy’s Cottage in Dartmouth and who hosted a family referred by the Rainbow Trust Children’s Charity. Also wee have a volunteers Forum on Facebook. Full of great people who are happy to help out with various bits and pieces. If we need an errand running or a bit of help with something we post it on there and anyone who can give us a hand lets us know. It’s been invaluable this summer but we’re always happy to have more people on board. There’s no obligation but you’ll see a notification when something crops up and, if you’re in a position to help out, you simply let us know. If you would like to be in the Forum simply let us know by e-mailing enquiries@thhn.co.uk and we’d love to add you to the group.